Its amazing what happens in pro football when a team becomes Super Bowl champion. Every little nuance is studied and every small flaw gets worked on until it becomes a crack, then transformed into a team’s Achille’s heel. However when you think about it, the same problems the Saints had in 2009 were there in 2010. In ’09 the ball just seemed to keep bouncing their way, from the Robert Meachem stealing the ball from a Redskin who intercepted Brees then ran it in for a TD, to the tipped pass to Darren Sharper who returned it for a clinching TD in a struggle with the Dolphins. What goes up must come down and all those you climb over to get that ring are all of those who will give you their best shot on your way down. Does it wear on a team? Week after week everyone takes their best shot and the war of attrition sets in…yes By the end of the 2010 season the New Orleans Saints were running on empty. We at the Taylor Blitz Times are still waiting for the Saints to tackle Seattle’s Marshawn Lynch. With the additions and target on someone else’s back, can they liberate the NFC South mantle from the Atlanta Falcons?? Quarterback: Aside from Green Bay and New England, no team is in better shape at the quarterback position. You could argue that Drew Brees is still the NFC ‘s best quarterback over Aaron Rodgers. Hell the NFL for that matter. Without his steady play this team would have slid into the abyss with a running game that wasn’t as formidable as the title run the year before. 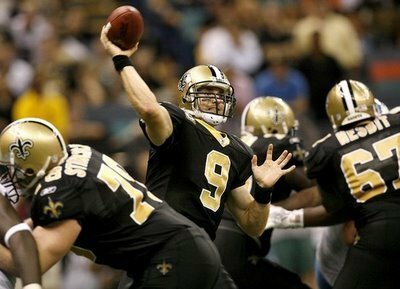 Although Brees passer rating dropped to 12th, (90.9) he threw a whopping 658 times completing 448 for 4,620 yards, 33TDs yet had 20 interceptions. Having to overcompensate for the anemic running game and being forced to throw, contributed to the high turnover totals. Sounds like a down year coming off of his 5,ooo yard masterpiece two years before but get this… He was still 3rd in yards passing, 2nd in touchdowns thrown while leading the league in completion percentage at 68.1%. Even in the 41-36 playoff upset loss to the Seattle Seahawks he was forced to hoist 60 passes. Far too many. He completed 33 for 404 yards and he was masterful in that game throwing no interceptions. He now ranks 1st in every Saints career passing category: yards, completions, attempts and touchdown passes. What hasn’t been showcased is how to get the best of Drew Brees as a defense. Even last season he threw several interceptions late in games when he was forced to take chances. Sean Payton has constructed a passing game that gets the ball out of Brees hands the instant his back foot hits the turf. They make great use of 3 and 5 step drops and bubble screens to get the jump on opposing defenses. Teams may be better suited to come up and press his receivers and send overload blitzes at him because the way the rules are now, he’s going to go up the field throwing 5 to 6 yard throws. Send a series of zone blitzes and overload blitzes to rough him up seems like the only way. Otherwise its basketball on grass and you won’t stop him. He is in his prime and barring catastrophy should have another 5 years left in him. Without question quarterback is Super Bowl quality in New Orleans. 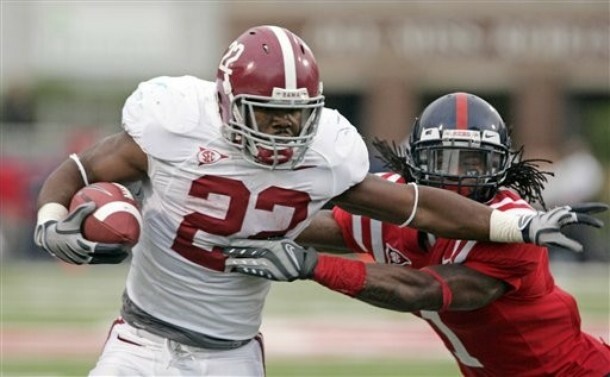 Offensive Backfield: After being derailed by backfield injuries, the Saints pulled the second biggest coup of the 2011 draft landing Heisman winner Mark Ingram from Alabama. They stole a lot of thunder being made on draft day by their NFC South rivals, the Atlanta Falcons, for trading up for Julio Jones, Ingram’s teammate from the 2009 National Championship team. This solves a tremendous problem the Saints have had for several years now: running consistently tough between the tackles. Many think Ingram is a “can’t miss” running back and an Emmitt Smith clone. A patient runner with short choppy steps who runs with a low pad level to prevent him from fumbling while powering forward for the tough yards. He had a few injuries in his senior season where he rushed for 875 yards, yet dazzled in his Heisman season where he ran for 1,658 yards and 17 TDs. The running back position in the NFL is not a position where a player grows into it. All great running backs have their best years in the first three. Running the football, Ingram will prove to be a fit immediately. Speaking of a fit, time to talk about a running back who doesn’t. This should spell the end for Reggie Bush who couldn’t make it work in the pros unless he was in space. A bust with a few splash plays per year doesn’t merit the $11 million he is scheduled to make this season. He has had some impact on special teams but face it, his 36 carries for 150 yards rushing and 34 rec. for 208 yards for a combined 2 TDs is nowhere close to enough. After Mike Bell departed for Cleveland, the rushing game was turned over to Chris Ivory, who led the Saints with 716 yards, and Pierre Thomas who gained 269 more. Yet each proved unable to handle the pounding and the Saints had to bring in former Dallas Cowboy Julius Jones off the streets to man the backfield in the playoff loss to the Seahawks. These backs just couldn’t stay on the field and when they were, the offense couldn’t sustain drives which caused team wide problems. Having to pass so much led to being unable to control the clock which put an undersized defense on the field too much. (See early 90’s Buffalo Bills) Its a systemic solution that one solid running back, in Mark Ingram, should solve. At running back the Saints leaped back to very good. He can also power the ball from in tight and the Saints should improve on 9 rushing TDs. Receivers: The beneficiaries to all this passing is a receiving corp devoid of stars yet are solid intermediate receivers. Marques Colston led the way with 84 rec. for 1,023 yards and 7 TDs followed by Lance Moore’s 66 receptions for 763 yards with a team leading 8 touchdowns. What is unique is Colston, Devery Henderson, and Robert Meachem are the same type of receiver, tall, rangy and they play relatively slow. Its Brees throwing the ball on time that makes this receiving corp look better than it is. Yet Moore is quick and darts in and out of small cracks to gain 40 first downs out of his 66 catches. 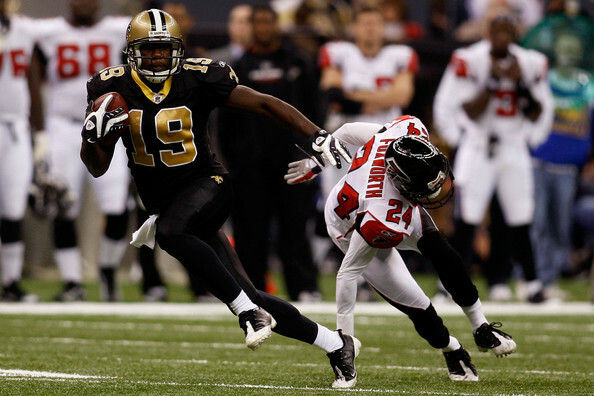 He and Colston each made 1st downs on their receptions 60% and 67% of the time respectively. This team runs the bubble screen as affective as any team in football. This was an extension of their running game in 2010. Yet this group is slow and defenses should press this group more. Teams are playing so fearful of Brees that they immediately drop into zones when this team has no burners on it. Defense this receiving corps with combo coverages on their slot players and get physical with your corners on slower receivers and make Brees throw out of rhythm. This pressure on the receivers would make Brees pump fake and pull the ball down allowing your pass rush extra time to sack him. Looks like the Saints will be moving on at tight end going with Jimmy Graham as Jeremy Shockey’s successor. Their numbers were nearly identical yet Graham reached the endzone 5 times to Shockey’s 3 yet this is a salary cap issue. They get to maintain that production while paying less and thats the NFL we follow now. Receiver is serviceable to good in the Crescent City. Offensive Line: In the words of Vince Lombardi, football is always going to be a game of blocking and tackling. Well this offensive line had some issues with the blocking side of that equation. This team only rushed for 1,519 yards (28th) yet averaged 4.0 yards per attempt yet had problems pushing into the endzone when the team drove down close. The 9 rushing touchdowns (28th) this team scored is evidence of that. What is unique is between the 20s this team ran off right tackle and gained first downs 67 times which ranked 9th. You would think that would translate down at the goal line. Puzzling. The Saints passing statistics from a line standpoint are mixed. One of the aspects of Sean Payton’s playbook is for Brees to get the ball out quickly with 3 and 5 step drops. The Saints were 5th lowest in sacks allowing 26th and were ranked 11th in allowing Brees to be hit 67 times. They need to improve on their pass protection with the Buccaneers building a strong defensive front as a division opponent and the Panthers will be building a defense under former defensive co-ordinator and current Head Coach Ron Rivera. 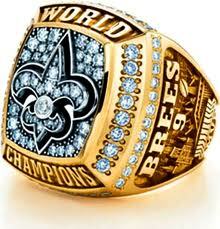 Teams will be coming after Brees and if he is injured the Saints would be in trouble. The New Orleans front did have a pro bowl performer in LG Carl Nicks out of Nebraska. This line is average to below average…just doesn’t get the push when close to the goal line and those passing numbers are high for a team that throws from short quarterback drop backs. Defensive Line: This line had a fair year yet needs some help. Of the 33 sacks the Saints collected, 21.5 came from a committee of 7 linemen with none totalling more than DT Sedrick Ellis’ 6. Will Smith needs to stop acting and rapping and get after the damn quarterback. His sack total of 5.5 doesn’t cut it for a former first round draft pick and is down from 13.5 from the year before. In defensive co-ordinator Greg Williams scheme, DEs are to get after the quarterback and check on the run on their way there. This is the system Jevon Kearse broke in with. So come on Smith, get after it. The Saints spent their1st round draft pick for the services of Cal DE Cameron Jordan to help bolster the pass rush. At 6’4, 287lbs he has the size and wingspan to rush in the pros. His father Steve Jordan was a pro bowl tight end with the Minnesota Vikings in the 80s and 90s so the athletic pedigree is there. They also drafted Greg Romeus out of Pitt to help get after the passer. Veteran DE Alex Brown may be the odd man out. If the Saints want to regain the NFC South crown one thing they need to do is play a little more stout up front against the run. This team was 16th against the rush and gave up a mediocre 4.3 yards per attempt. At times this line was shoved into the linebacker and the safeties faces. With big running backs to face in the division with Atlanta’s Michael Turner, Tampa Bay’s Blount, and Carolina’s Jonathon Stewart / DeAngelo Williams combo, this has to be a priority. Surprisingly they didn’t draft a DT, yet right before the lockout they picked up Shaun Rogers, former Cleveland Brown, to help hold the middle. At 6’3 350 lbs he should eat up blockers and allow Vilma, and Shanle to make plays. Defensive front is slightly below average and they should get another DT when free agency opens up. Linebackers: The anchor of this defense is Pro Bowl MLB Jonathon Vilma out of the University of Miami. He led the team with 107 tackles, had 4 sacks and forced 3 fumbles. He’s instinctive and quick yet at 230 lbs can be engulfed by blockers so its imperative the DT play improves. Scott Shanle (76 tackles) and Danny Clark (59 tackles) are the starters on the outside. They’re solid tacklers yet rarely make big hits or splash plays. Between the two of them there wasn’t a sack or interception turned in all year…and they still haven’t tackled Marshawn Lynch. Saint’s brass must be in agreeance with us since they spent two draft picks here on Illinois linebackers Martez Wilson and Nate Bussey in the 3rd and 7th rounds respectively. Linebacker is below average thanks to the outside ‘backer play. This group needs to force more turnovers and its puzzling that they don’t since they play pretty fast. Secondary: When a pass rush can’t get to the quarterback, the play that is most affected will be that of the secondary. The starting quartet only pulled in 5 interceptions among them. Former Buckeyes Malcolm Jenkins and Jabari Greer each had two interceptions. The secondary missed the veteran play of Darren Sharper at free safety, however Jenkins is a converted corner and should grow with the position. Its a good thing SS Roman Harper likes to tackle, he gets many shots at it. Not only did he make the pro bowl in 2010, he was second on the team with 94 tackles, had 3 sacks, and forced 6 fumbles. Thats a tremendous performance. Tracy Porter only had 1 interception in 2010 while defending 6 passes. This is as solid a secondary as the NFC South offers. It rates better than what is shown statistically. Once the pass rush resumes, this team will pick off more passes. Porter in particular since Will Smith is on the same side. It sounds like we’re piling on Smith but one of the recipes for interceptions is for quarterbacks too throw over a disruptive, tall pass rusher. If you can’t get to the quarterback, at least get your hands up. This is how Lester Hayes once picked off 13 passes in a season behind a 6’8 Ted Hendricks, and an Everson Walls snatched 11 the next year behind a 6’9 “Too Tall” Jones. Smith did deflect 5 passes last year so keep watching. Overall: This is going to be an interesting year for the Saints. Drew Brees enjoys being one of the faces of the league, will he turn around and hand the ball off to Mark Ingram as much as he should?? Brees like any other good athlete has an ego. This will be a good watch to see what he audibles to and how he responds if his rhythm is thrown off with a more balanced attack. Will Ingram fit into the passing game well enough so they can have him as an every down back? If he is platooned, the Saints could suffer from the syndrome that affected the Dallas Cowboys last year. They telegraphed what they were going to run based on which running back was in there. Defenses would get the jump on them. We’re still unsure at Taylor Blitz Times if they did enough on the defensive front to solidify themselves against the run. We see a mixed year coming up with a record of 9-7 to 10-6 and another wild card berth.